In this study, a Finnish telecommunication company is analyzed from 1990-2007. Discussing the major developments in technology, society and firm-level decisions, this study focuses on the R&D process development and changes due to these exogenous and endogenous factors that have occurred. These factors have also caused changes in the company’s competitive advantage, organizational structure, product- and service portfolio. It has required adaptation skills and capabilities to manage change in order to survive in a rapidly changing competitive environment. This chapter will describe the changes in the R&D process from the in-house development to a multi-partner R&D network. Information and Communication Technology (ICT) can be considered both a strategic catalyst and enabler of business process reengineering (BPR). In summary, the chapter discusses how a competitive advantage in mobile and multimedia business was created by efficient process changes and network management capabilities. Over and above the managerial challenges inherent in a business creation and development, high-tech companies face unique challenges due to technology-driven services and markets. These firms need to cope with exceptionally short product life-cycles in the face of fast changing technology and need to be able to adapt to rapidly evolving or collapsing markets (cf. McGrath 1995, 4). In high-tech and knowledge-intensive industries, R&D-partnerships, alliances and coalitions are often used for creating new technological platforms and dominant solutions (cf. e.g. Blomqvist, 2002; Möller and Rajala, 1999). Recent years have shown an exceptional growth in demand for inter-organizational partnerships (Achrol and Kotler, 1999; Brandenburger and Nalebuff, 1996; Gulati, 1998; Gulati et al, 2000; Hagedoorn, 1990, 1995; Spekman et al., 2000) resulting from the rapid pace of technology development along with the dispersion of knowledge and technological resources. Partnering is a process where a customer firm and supplier form strong and also broad social, economic, service and technical ties over time (Anderson and Narus, 1999). To be competitive and survive in a network economy, organizations need efficient business processes within and between the partner-organizations that are creating services or products together. In this chapter, the concept efficiency describes the efficient use of resources available and tuning business processes so that there are no overlapping tasks. Effectiveness refers to a capability to produce more innovations from R&D-process or new product versions from the product maintenance process into the commercialization process. 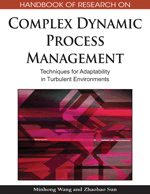 Moreover, the capability view requires also the explanation of how processes and capabilities are linked, for example, Eisenhardt and Martin (2000, 1107) defined dynamic capabilities as the firm’s “processes to integrate, reconfigure, gain and release resources,” to match and even create market change. This chapter describes a new business development based on technologies, like broadband, Internet and mobile in Finland. In addition, a pioneering actor as the case organization in this study was, it had to develop specific managerial capabilities in order to be able to fine-tune the existing processes to adjust to new demands and market changes, to launch new services and to advance from the development of basic technologies to the commercialization and marketing of information and communication technology (ICT) -solutions and home commerce (HC) -services. The business development and success was based on adaptive and adjusting R&D process and business process development. In other words, the purpose of this paper is to describe how the ability to develop efficient process management was a critical condition for success. Actor: is a firm or an individual that perform activities and control resources and create value via transformation of resources. Actors refer to the business network participants. Partner: is an actor that is associated with another or others in an activity or a sphere of common interest, especially a member of a business partnership. ICT sector: includes both the Information Technology (IT) and telecommunication sector. The latter includes both the service and the manufacturing industry. The previous includes all the software and hardware manufacturing and developing companies. Exogenous: i.e. they may arise from the overall business environment and include changes in technology, industrial structure and economic recession. R& D (Research and Development): Discovering new information and knowledge about products, services, and processes and then applying that knowledge to create new and improved products, services, and processes that fill market needs.